Write-up: pre; post. Sorry, no pics yet! They're coming, honest! 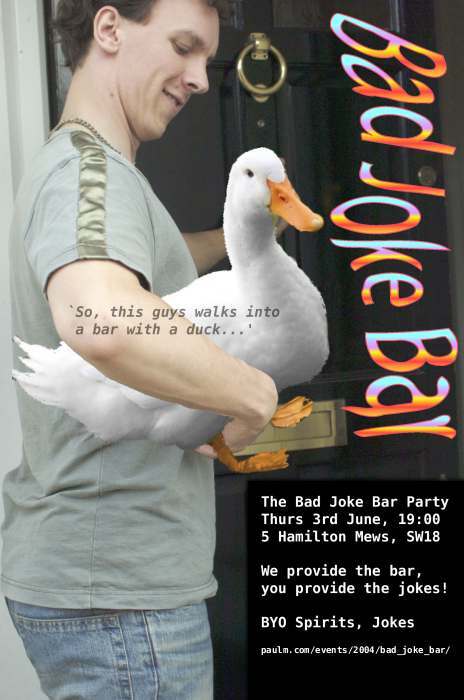 The Bad Joke Bar - we provide the bar, you provide the jokes! First appearing at Burning Man the Bad Joke Bar became quickly famous in the desert for serving up cocktails in exchange for dire humour. One rule: one joke, one cocktail, all night long. Surf around for the worst jokes you can find. Print them out and bring them along if you like! A guy walks into a bar [google]... Each one you tell is worth a drink. We'll have a sound system but if anyone fancies bringing something more substantial, lemme know. Sign up to hear about these sorts of things: go to [Events] mailing list page.